Music in the public domain can be used copyright free for both commercial and non-commercial purposes. The following MIDI files are all in the public domain, and can be downloaded for free. To download these files, simply click on the title of the piece. A new tab or window will open, and you will be prompted to either open or save the file. Choose to save, indicate where on your computer you would like to store the file, and then click "OK."
Blossom Time is the English version of a Viennese operetta based on the works of Franz Shubert. The music was adapted by Sigmund Romberg, and the operetta debuted on Broadway in 1921. It became the second-longest running Broadway show of the 1920s. Blossom Time is a fictional account of Shubert's love for a woman named Mitzi. While he finds that he is too shy to approach his love, the feelings he has for her act as inspiration for some of his greatest musical works. 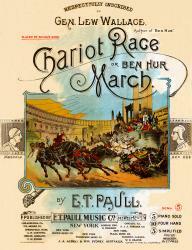 This march composed by E.T. Paull tells the story of a historical event from start to finish. In The Burning of Rome, the musical tale begins with the entrance of the performers at the Colosseum, and ends with the fire erupting and alarms sounding. E.T. Paull himself wrote a detailed description of the music and how he wanted it to be played, and noted that he hoped that this would be "his masterpiece." Taken from the musical The Passing Show of 1918, this waltz became a popular tune that was covered by numerous artists including Doris Day and Lawrence Welk. The lyrics are credited to "Jaan Kenbrovin," which is an amalgamation of the names of a trio of songwriters that included James Kendis, James Brockman, and Nat Vincent. While the song itself is pretty, the song has a sad undertone as the bubbles themselves represent hopes and dreams, and they pop soon after being blown. Music by T. B. Harms & Co.
T. B. Harms & Co.
Ka-Lu-A is a song from the musical Good Morning Dearie. What's remarkable about this piece is the bass line, which is a very simple, repeated rhythm that drives the song from beginning to end. Shortly after the musical opened, composer Jerome Kern was sued by one of his peers, Fred Fisher, who claimed that the bass line was stolen from one of Fisher's own pieces, called Dardanella. Fisher won the lawsuit, but Ka-Lu-A became a hit in its own right and was recorded by a number of popular orchestras in the 1920s. Ragtime music was at the height of its popularity in 1917, and this novelty tune is a fun example of the upbeat nature of the genre. Mammy Blossom's 'Possum Party is an exact copy of an earlier work by Theodore Morse and Arthur Fields, called Auntie Skinner's Chicken Dinner. Only the lyrics were changed for this version of the song. Oddly enough, both tunes proved to be popular with ragtime bands. This ballad was written and originally recorded in 1920, with several different artists covering the song for the next few decades. Frank Sinatra and the Tommy Dorset Orchestra recorded Pale Moon - An Indian Love Song in 1940, and as with most of Sinatra's work, it became a classic. A few years later Tex Williams and Spade Cooley gave Pale Moon a western swing twist with their version of the song. This ragtime-era ballad was composed by Chas. L. Johnson, a prolific songwriter who penned numerous songs during the early 1900s. While Johnson was well-known for his ragtime tunes, this song takes a different approach and expresses the feelings of a traditional love song. He reportedly earned $30,000 for the song Sweet and Low, which made it the most profitable piece of his career. Irving Berlin is best known for writing the consummate holiday song White Christmas, but his portfolio of music covers a wide range of popular songs. When I Leave the World Behind is a heartfelt tune that laments the wishes of a common man as to what he wants to leave behind when he passes away. Instead of money and power, he wants to leave a legacy of peace and happiness. T. Jay Flanagan & Co.
F. B. Haviland Pub. Co.
Helf & Hager Co., Inc. Most public domain music is close to a century old, or even older in some cases. Many of these tracks are forgotten gems that have lost favor over time. No matter what you end up using these MIDI files for, you'll enjoy hearing these wonderful old tracks and learning about the history of the songs and their composers.